Choosing between the different types of blinds can be quite a task. You want them to look great no matter which type you choose. 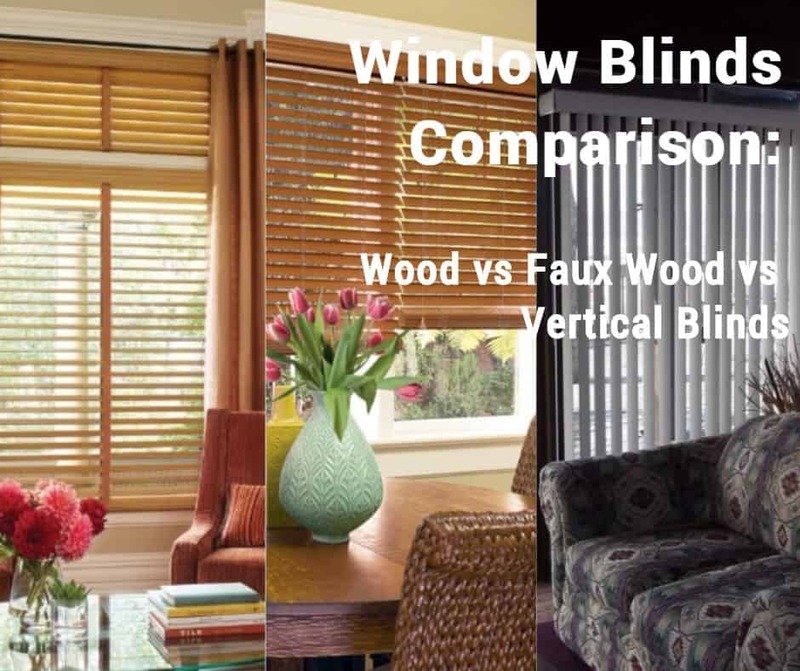 Learning about the different types of blinds and in what situations they work best can help you to make an informed decision about your window treatments. Wood blinds bring a warm but elegant appearance to any room in your home. They work well in any decorating situation ranging from traditional to contemporary. Real hardwood blinds are available in a vast amount of colors and stains to match your décor. One drawback to using wood blinds is that you shouldn’t place them in a room with high moisture, such as a kitchen, bathroom or laundry room window. Real wood is susceptible to warping in high-moisture applications. This type of blind is lightweight, making them easy to raise and lower. This puts less strain on the mechanism and makes them lasts for many years to come. Since they are lightweight, you can use them in very large windows and still open and close them with ease. Real wood blinds act as an insulator against the cold and the heat from your windows, thereby lowering your utility bills all year round. When wood blinds are closed, they protect your furniture, flooring and paintings indoors from fading. Wood doesn’t give when pressure is applied to it, making it more fragile than faux wood. It also doesn’t stand up to a lot of wear and tear from children or pets and it should never be exposed to harsh cleaning ingredients. Faux wood blinds appear to be real wood, but they are more flexible and resilient and tend not to break as easily as real wood blinds. Faux wood is actually much heavier than real wood, so they can be a bit harder to lower and raise if you use them in a large window. There may be fewer options in larger sizes due to the weight. 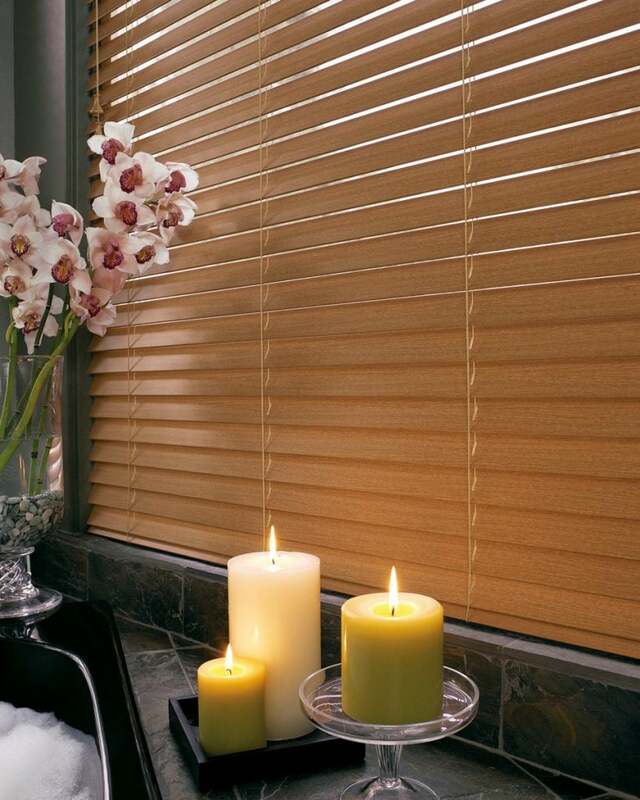 Faux wood blinds are made partially from vinyl or PVC, allowing them to resist moisture and making them a great addition to a bathroom, kitchen or living room. It’s easier to clean faux wood blinds over real wood blinds because you can use whatever cleaning solution you would like. Faux wood blinds do have limited amount of colors, which makes them hard to match up to your stained window frames. Some have foam in them, in the less expensive class and this is less durable and tends to turn yellow over time. Since faux wood is heavier, they have less horizontal space between the cord ladders to make raising and lowering them easier and to decrease wear and tear on the mechanism. IF you are incorporating decorating tapes over the cords to hide them and add flair to your window coverings, then faux wood blinds may look excessively bright. Vertical blinds work really well on large windows due to their construction. This is why you will notice those covering windows in office buildings. Vertical blinds can work in just about any situation. When you close them, they stack together and take up less space in your window casing than curtains would to allow more warmth and light into your rooms. You have a great control of light and heat with vertical blinds, as you can open them partially or entirely. Vertical blinds do require regular cleaning due to the dust accumulation on them. Even when fully closed, they may not block all of the light from a room due to the slatted design. In this instance, they wouldn’t be as energy efficient as wood or faux wood blinds. They also don’t retain heat as well as the other two types of blinds, as they are made of a thinner material. If you have children or pets in your home, you may not want this type of blinds because the thin slats bend and break really easy. This type of blinds have the most available styles in your home décor. You may opt for heavy-duty plastic or a resin-backed fabric in a decorator design. You can choose to add a splash of color to any room with a solid color material, or a great flair with brocade fabric or even chenille for a great texture to any room. Now that you have all the facts about the different types of blinds, you can make an informed decision on which type best suits your needs and provides satisfaction for you for many years to come.